There I was watching ice melt in a glass of water. I noticed something. As the ice melts the level of the water didn’t really change. I guess I knew this already. I mean this seems like something from middle school science as we talk about displacement. Or maybe it was from the “Eureka!” story about some naked guy jumping out of a bathtub in ancient Greece (Archimedes the mathematician). But I digress…but what doesn’t catch your attention in a story more than seeing how the word naked is being used to teach something, eh? Back to water, and ice and the like. I was driving down Lakeshore Drive in Chicago yesterday and there was this lake (Michigan to be exact) and ice. It gets cold here. The level of the lake doesn’t change much either from the summer to the winter. That frozen lake I was walking on in Wisconsin on New Year’s Day was the same way. The level in the glass or these lakes with or without ice was the same. I have been working on my resume and helping a few people with their resumes lately. This task is tedious. It is hard to say what you need to say to show how you know what you are doing, and that you have accomplished. BUT…we are so conditioned to not be too boastful. However, we don’t do a little boasting who will? I wasn’t looked at for one job because I wasn’t explicit enough about my experience in business and on-campus (with students). I assumed the people on the committee would look at my resume and see both types of activities together and make the connection that I could combine them; bad assumption on my part. Lesson one in job search. Help connect those dots, create a nice picture of you, and not worry about the boastful part. I think we can call this confidence – he says in an almost confident manner J. Another thought about the experience timeline and all of the jobs that we have completed in the past may at some point look completely disassociated. Or maybe after writing and revising so much we forget what attracted us to a position and how it fits in with our talents, strengths, expertise, and follows some line of reason. It must work this way though; the common denominator would be us… right? Back to this glass of water thing, I started with. There is a method to my madness here; it wasn’t just to get your attention. Think for a minute that each one of us is the glass of water. It can be half full, half empty, or fully full…or something we just need some water in there to start. The half-full/empty thing is a whole other blog post all together. Into this glass put some ice. You can use cubes, ellipses, half moons, crescents, or even crushed for this example. The water (in the glass) is you. The ice in the water in the glass is your experience or the different jobs that you have completed in your life. The ice is suspended in the water. At first, we can see the ice in the water. We notice there are some experiences floating around in the water. We can see some shape. We can see the edges. Perhaps those edges show some limits to our experience. I mean, as good as we are there hopefully is some limit to what we know (or what we are willing to admit we don’t know) and time and experience helps us expand our knowledge and our edges might get soften a bit as we build more capacity. Melting might seem like a bad thing. But in my example, and story here, ice melting IS the example. When the ice is melted it is all water. We are still us, but now we have new experience that has become us. We have grown in our ability and how we approach things. We look the same – water is still water – but we are different. We have experience. When we add more ice (more experience or a new job) we can see those chunks of experience again. Now we also have the addition of a new understanding. Our water is different, but we may not look any different. This is a German word for form or structure. It is the whole. A gestalt is the summation of its component parts. 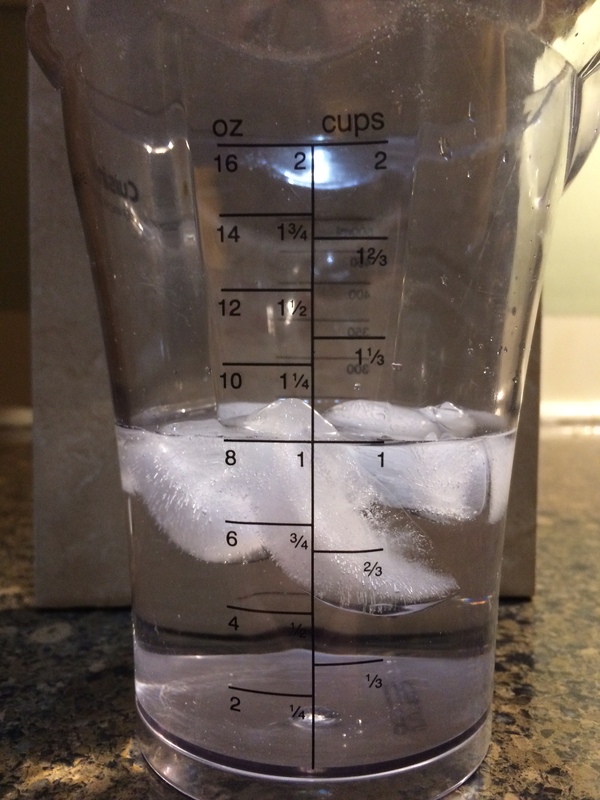 It is impossible for us to refreeze the chunks of ice in our class in the exact way that we added them to the water. It is a little different from a similar word, synergy. With synergy, the whole is greater than the sum of its parts. Meaning together we can accomplish even more. Gestalt is a whole it is a unified whole – like our resume. I mean like our glass of water. You might be thinking WATER?! I want to be juice or something (did someone say gin and tonic?) a little more spicy than water. I use water for a reason. Ice in water is more water. Ice in any other beverage will dilute the experience. Our resume and our experience aren’t diluted over time in any way. Even experiences that weren’t perfect help us grow in a positive direction. We know what we don’t want to do, or how to not do that again. Besides, water is in everything. H2O makes up so much of us, the earth, the atmosphere, everything. It just makes sense to use water in the example. When we have ice in water a lot of the time, we get some condensation on the outside of the glass. This happens in learning, experiences, and jobs too. There are things that we don’t need from many of our experiences. We can just let those go. We can shed those – if you will. Leadership is about the accumulation of abilities and the derivation of learning from our experiences. Our leadership can be tied back to our chunks of ice in the water. Our leadership insight (or one of my favorite words – acumen) comes from the experience of being a leader and even of being a follower and participating in some way in the leadership experience. It might be vicarious, but we can still learn from the experience. Think about your chunks of experience. Can you pull out the direct lessons from those chunks? Are you a different person now after having been exposed to the new ice chunks floating around in your glass of water? Great perspective, Rich. I like the way you think!